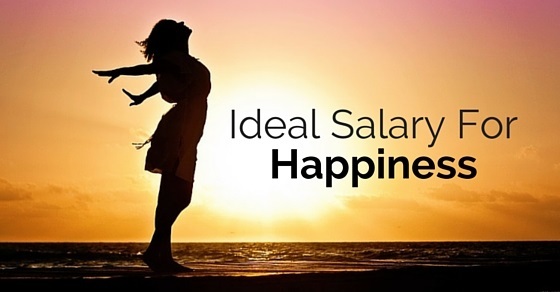 Ideal or Perfect Salary for Happiness: How to Achieve it? A good salary is something which everyone intends to earn to be happy, be it to pay the rent for a nice place to stay, to travel, do shopping also is capable enough to save some money from it too. As per a research done, depending on each country the average salary to be happy varies. As per a recent study done by two Nobel Laureates to know the annual salary which will keep the person happy is 75,000 USD. In this process of research, they have considered various factors of advancement in technology and healthcare of past hundred years. Before working towards achieving your ideal salary, first and forehand, calculate your essential monthly and yearly expenses. From how much you intend to save right now and how much you are keen in saving future, include rent, monthly additional expenditures, insurance and other necessary expenses. Calculating your expenses will give you a fair idea about how much you will require to spend every month. The next step is to finally, understand your ideal salary. There are various online calculators that can help you calculate the ideal salary. Ideal salary depends from person to person, therefore, it is better to focus only on your needs and prevent from comparing from others. In case you do not want to rely on these calculators, then it is advisable to know the standard salary in your industry or connect to an experienced person in your field. If you are in initial phase of your career then understand what kind of job will help you achieve the ideal salary. Or if you are with experience then learn the facts how many promotions away are you from your desired salary. These simple answers will help you plan and find the accurate solution for your job role. If you have been in a job role for quite longer period of time, then switching your career path will help. Ensure that you are capable enough to convince the company how your skills will be helpful for them and how you can incorporate previous experiences for their benefit. Big companies tend of have various branches across the world. If you are flexible for relocation then it will work in your favor. Since employers like people with flexible work attitude, this will give you an opportunity to negotiate the salary in your advantage. Not only in the form of increment this is beneficial but gives you option to also negotiate for additional benefits for relocation, from transportation charges to shifting charges, also you can ask for a place to stay from your employer. The ideal salary is also dependent on the geographic location of the place. People working in metro cities tend to have higher salary while people working in smaller cities with similar job roles will have lower salaries.Since the cost of living in metro cities is high as compared to smaller cities hence, the size of pay check goes up accordingly. Hence, geography of the workplace plays an important role to achieve that dream salary. The paycheck of every industry varies as per their importance in the market. For example, the starting salary of an engineer will vary from that of an accountant or a plumber. So be clear about in which industry you are because that will have a big impact on your salary. Also, as per the industry the ideal salary will vary hence, know the growth pattern or promotion reuiqred for you to reach the ideal salary. Avoid switiching careers frequently, if salary is your main motive then sticking to one job for a longer time will result in better pay package. Staying in a job for a good period time allows a person to acquire good amount of skills and assures the next employer about your loyalty. Working in a single job for longer period of time may be frustrating and boring but it does reap benefits for the longer period of time. To achieve the best salary as early as possible is to negotiate properly in your first job itself. The bigger salalry window you achieve in your first job, easier it is to reach to the ideal salary. Because during the company promotions and increments it wil consider your initial salary, later when you look for a job change, your salary and hike will be taken in consideration. Many a times people tend to have low base salary but huge benefits with it. For example, great incentives, various forms of reimbursement, various kinds of medical reimbursements. Sometimes these additional benefits may not add up to your salary but they are quite helpful in creating an opportunity to save a lot on your salary. Therefore, it is beneficial to talk to your employer and learn about the benefits you might earn if your salary is low. Another best option to increase your pay is to find an alternative source of income, for example, convert your hobby as a side business and sell something over the internet. The initial earning might be low but over the time this will generate good revenues for you. Having a backup option is never a bad idea and using it for your benefit is always good. Even if your salary is low, this additional money will make up to the gap you might be having in your income. Later if you are successful in it then you can pursue it full time. Another way to add on to your salary is doing the right investments. Put your money in various good invest plans from fixed deposit to recurrent deposit, or tax saving schemes. Also ensure to have your various insurance plans in place from heath insurance, retirement schemes and vehicle insurance. These good insurance plans will help you to save from spending extra money during the time of emergency. Hence, always know the various investment plans and ensure to put a part of your money in it regularly. To stay ahead of everyone one need to constantly enhance their skills and capabilities. In career ahead, these additional skills are helpful in career growth and promotions eventually adding up to more salary and job benefits. Hence, ensure to update your skills and your job related from time to time as this will help you in negotiating your salary form the employer by proving your worth to him. An employer will pay only if they think that an employee is worth it. Hence, be smart and not only with your hard work and dedication also work smartly and try to be ahead of everyone. Know your job so well that no one else is better than you. Put your extra effort and try to generate more revenue to the company. Once you prove your true worth and value to your employer, the possibility of promotion and financial growth is inevitable. Earning a good salary also means to prevent oneself from extravagant expenditure. Prevent yourself from unnecessary spending money, if you do not need anything then better not to buy that thing. Impulse buying hampers your pocket and creates a disbalance between your saving and spending value. Plan your purchases before and do not go beyond it until it is not of extreme importance, this will help you in saving a lot of money eventually. In case you are looking for a job change then never hesitate to use your network for the benefit. People you know in companies which pay well to their employees, contact them, share your CV with them and let them know about your future prospects of the job change. Networking of people never goes in vain, one or the other person may help you land up in a suitable job. This is will help you in reaching to your ideal salary and better opportunities. These above points will help you acheive your ideal salary, but there is no specific rule for it, therefore, keep looking out the opportunities around you and grab them immediately. A good salary does mean an option to have a better life and good saving. To live a good life, find out the best possible ways to increase your income. If you have been in a single job for too long and do not find any growth happening then it is advisable to look for another better job, hence, this will give an opportunity to see a financial growth in your income. Previous articleHow to Make The Most of Your Year End Bonus?